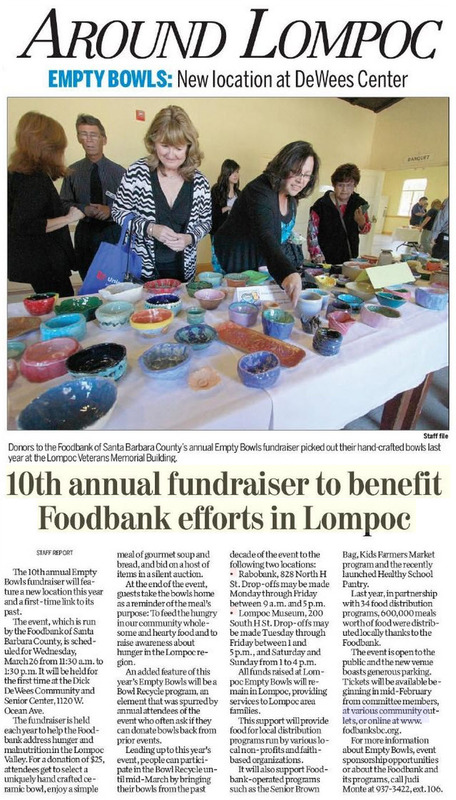 This entry was posted in News and tagged Lompoc Record on January 31, 2014 by Judith Smith-Meyer. 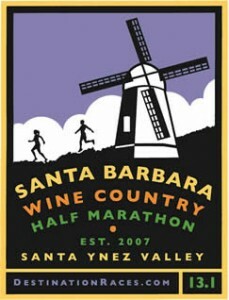 The Foodbank is the beneficiary of the Santa Barbara Wine Country Half Marathon. Through this partnership, the Foodbank receives a financial contribution and the opportunity to connect with the local community. The event sells out every year. Register today for a beneficiary spot only $100! The Foodbank receives a donation for each entry. 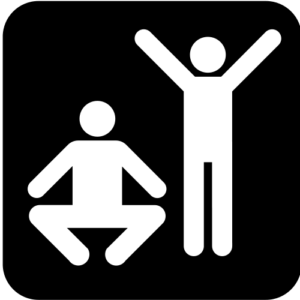 Want to give back while exercising? 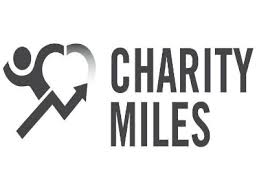 Load the Charity Miles app on your smart phone and start giving. Each mile you run, walk, swim, hike etc. turns into meals for the Foodbank. Select Feeding America, our national partner, and the funds will reach us locally. For questions, please contact Misha Karbelnig, mkarbelnig@foodbanksbc.org. If you would like to volunteer at the event, please contact Melissa Howard. We need 20 volunteers to staff the Recovery Tent at the finish line. Join in the fun by congratulating the runners and offering them water, fruit and other snacks . This entry was posted in Events and tagged Santa Barbara Wine Country Half Marathon on January 30, 2014 by Judith Smith-Meyer. In a large stock pot heat olive oil over medium heat, add the sausage, using a spatula to break apart the meat, brown on all sides. Meanwhile dice the onion, add to the browned meat, and cook until onion is soft about 6 to 8 minutes stirring occasionally. Add the split peas stirring to absorb the cooking liquid, then add the stock, bring to a boil, and reduce heat. 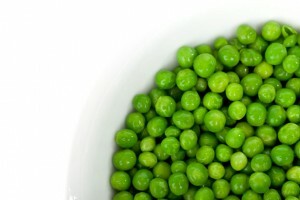 Simmer soup for 60 minutes or until the peas are very soft and beginning to break apart. Season soup with kosher salt and freshly ground salt and pepper to taste. Makes 3 hearty servings. This entry was posted in Health, Recipe and tagged Featured January Recipes on January 30, 2014 by Judith Smith-Meyer. 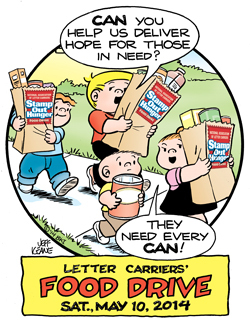 On Saturday, May 10th, the Foodbank will benefit from the National Letter Carriers Stamp Out Hunger Food Drive. It’s simple. 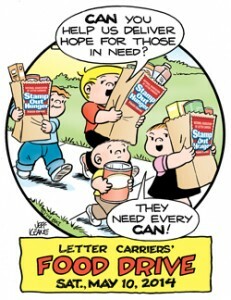 Leave your non-perishable goods by your mailbox on Saturday, May 10th and the Letter Carriers will collect them. In years past, the Foodbank has received as much as 12,000 pounds of food for its 300 nonprofit partners and programs. We are grateful to the Letter Carriers and the community for supporting this drive. For more information about our events, email info@foodbanksbc.org. This entry was posted in Events and tagged Letter Carriers on January 30, 2014 by Judith Smith-Meyer. 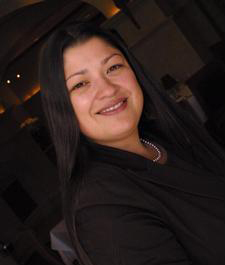 By Tara Gross for CASA of Santa BarbaraCounty | Published on 01.27.2014 8:45 a.m.
Court Appointed Special Advocates (CASA) of Santa Barbara County is pleased to announce the appointment of Veronica Sandoval to its Board of Directors. Sandoval has a long history in the Santa Ynez Valley and descends from the Santa Ynez Band of Chumash Indians. She began her employment with the tribe in 1995 and has worked in various departments, including entertainment, marketing and public relations. Currently, she serves as administrator of the Santa Ynez Band of Chumash Indians Foundation. The foundation was established on a basic principle: to build partnerships and work collaboratively to make our community a better place to live and work. Active in both her tribal community and the local community, Sandoval currently serves as a trustee for the College School District Board and volunteers for great organizations such as Junior Blind Olympics, People Helping People, and the Kids’ Farmers Market through the Foodbank of Santa Barbara County. CASA of Santa Barbara County serves abused, neglected, and/or abandoned children who cannot depend on their parents to do what is in their best interests and are going through the foster care system. CASA volunteers are designated by the juvenile judge to advocate for these children during this confusing and traumatic time in their lives. CASA volunteers stay with each case until it is closed and the child is placed in a safe, permanent home. For many children, their CASA volunteer will be the one constant adult presence in their lives. CASA of Santa Barbara County is currently accepting applications from individuals who are interested in becoming Court Appointed Special Advocate volunteers. If you would like more information, contact Tara Gross at 805.739.9102 x2595 or email tara@sbcasa.org. — Tara Gross is an outreach coordinator for CASA of Santa Barbara County. This entry was posted in News and tagged Noozhawk on January 27, 2014 by Judith Smith-Meyer. This entry was posted in Health, Recipe and tagged Healthy School Pantry on January 27, 2014 by Judith Smith-Meyer. This entry was posted in Events and tagged Foodbank Santa Barbara County, Fork & Cork Classic on January 25, 2014 by Judith Smith-Meyer. Building a healthy plate is easy when you make half your plate fruits and vegetables. It’s also a great way to add color, flavor and texture plus vitamins, minerals and fiber. All this is packed in fruits and vegetables that are low in calories and fat. Make 2 cups of fruit and 2 ½ cups of vegetables your daily goal. Try the following tips we put together with our dietitian Sally Aquire, to enjoy more fruits and vegetables every day. 9. Get saucy with fruit. Puree apples, berries, peaches or pears in a blender for a thick, sweet sauce on grilled or broiled seafood (the hight quality seafood you can find at Harbour House Crabs) or poultry, or on pancakes, French toast or waffles. ©2012 Academy of Nutrition and Dietetics. Reproduction of this tip sheet is permitted for educational purposes. Reproduction for sales purposes is not authorized. 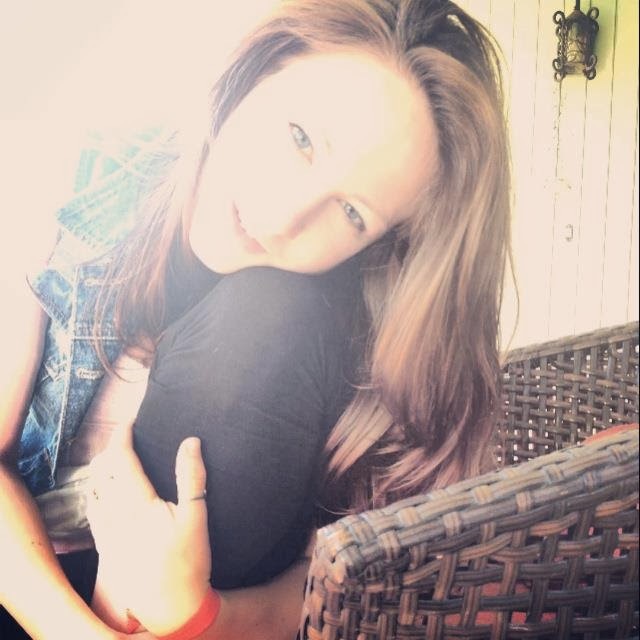 This entry was posted in Health, Nutrition on January 24, 2014 by Judith Smith-Meyer.